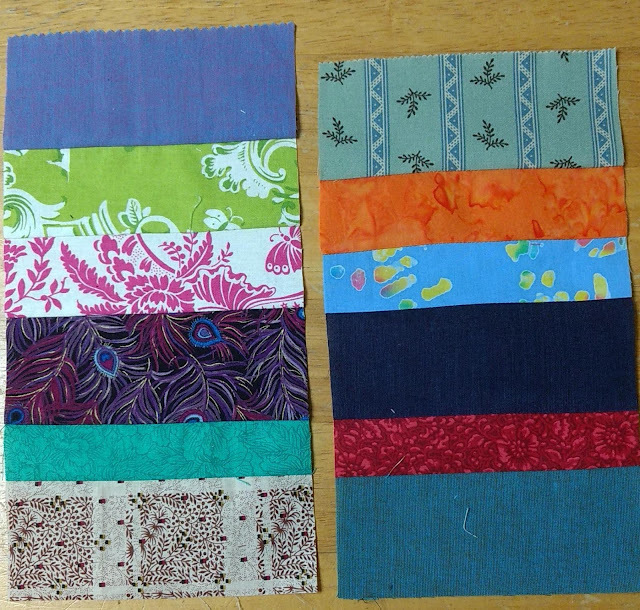 This morning I grabbed some strips from the jelly rolls and cut off 18 inch pieces from several strips. Then I grabbed some scraps and ironed them flat. Strips six inches long were cut from all of them and placed by the sewing machine. I started just grabbing what I thought looked good and sewing strips together. I specifically cut the strips into different widths for more variety. I also used some pieces that I cut off the scraps that were "too short" for a coin. The trick is to use some background fabric on one or both ends to make a short coin work. The background fabric on the ends will blend in when you put the quilt together. I did a little "mock-up" just laying the pieces on some of the background fabric so you can see. As you can see that will add another dimension to the stacks of coins. You can also sew several of those together and have a very roughly stacked appearance. I may do a stack of those for the middle or the back of the quilt. Coin quilts are simple and fun. After all, we all need a bit of playtime. I don't think I've ever heard of coin quilts. This is very interesting my friend!!! Coins and crumbs ... it's amazing what a machine can do ... if you can get it to work, that is. Great examples. I do love sewing these. I often piece in similar fabrics to be a single strip too. Love a little play time...and your coins. Coins are another trick for using up scraps...I haven't tried that one yet but will add it to my list. I still have two bins and a large bag of scraps to sort. I'll be on the look out for some potential coins. I know I have an ugly jelly roll somehwere.